Since I love to scrapbook, stamp and paint (and do anything else creative), I find myself spending alot of money on supplies. 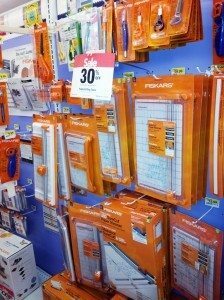 Scrapbook stores are great for browsing, but I really prefer the larger craft stores. I especially like filling my shopping cart with all the supplies I need to do something new — a craft I’ve never done before. I can deal with the cost of paper or a new paint color, but the larger items usually leave me at the checkout line with an upset stomach. My husband will be the first to tell you that I’ve tried every kind of craft there is, and sometimes (ok, most of the time) it doesn’t turn into a “passion” for me (example: watercolor painting). There are a few ways to make the dent in your wallet a little easier to deal with. The largest craft stores all provide an easy way to save some money and buy craft supplies at a discount. If you have an expensive item to buy, it’s well worth it to make a special trip… with a coupon in hand! Hobby Lobby almost always has a weekly coupon in the Sunday newspaper. As far as I can tell, it’s always 40% off one regularly priced item. You can also sign up for Hobby Lobby emails or go to their website and print the latest Hobby Lobby coupon to use in the store. You can only use one coupon per visit, but there’s nothing stopping you from printing off more than one and making several trips. Hobby Lobby has a great app for your phone as well. JoAnn’s also has great coupons, but they usually come via email or direct mail. I’m signed up for the mail list and the email list, and it seems to me that I get more regular coupon offerings through email. If you would like to sign up, just go to JoAnn’s website and give them your email address. These are typically 40% or 50% off one regularly priced item. You can also download the JoAnn app on your phone for the most up-to-date coupons and sales. Michaels also has a great mobile app, as well as an email list, and coupons in their sales fliers. Most Sundays you’ll find them in the local newspaper, but not every Sunday. Just keep an eye out. I think I’ll be using my next coupon on a Sizzix Die-Cutting Machine (… just don’t tell my husband).